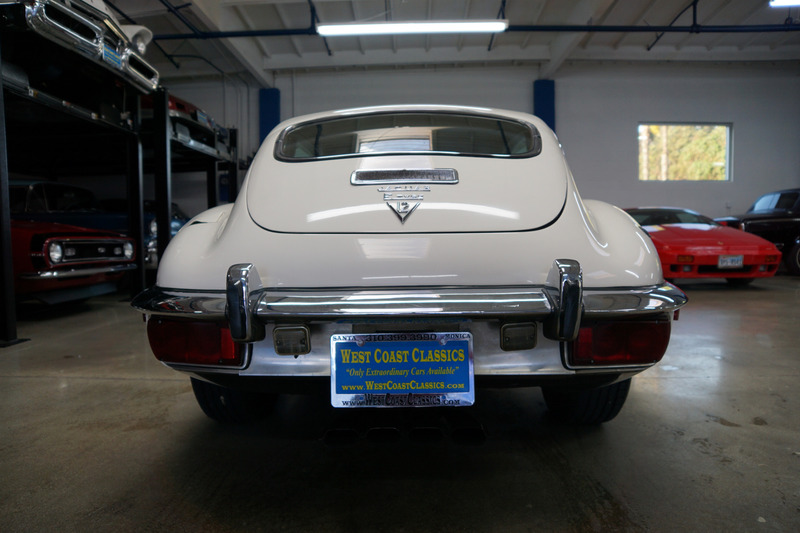 West Coast Classics are proud to present an exceptional and very rare and virtually completely original apart from one older repaint on a barn-fresh (garage really!) 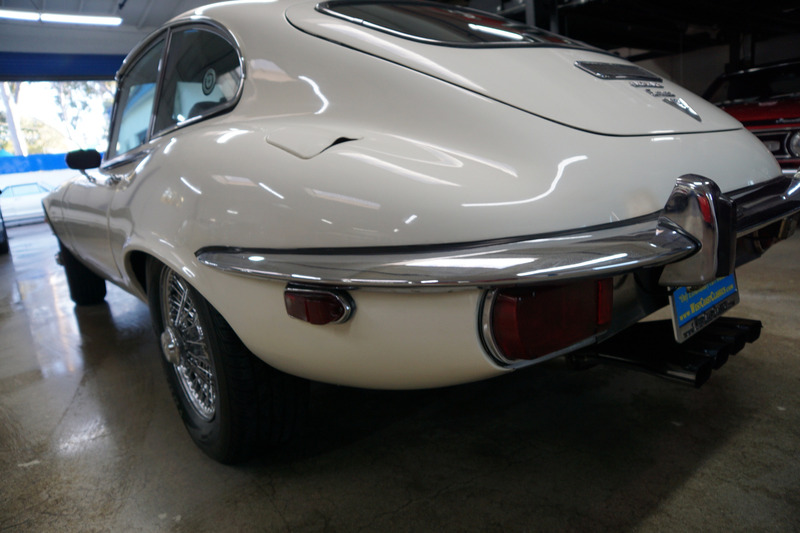 older restoration find! 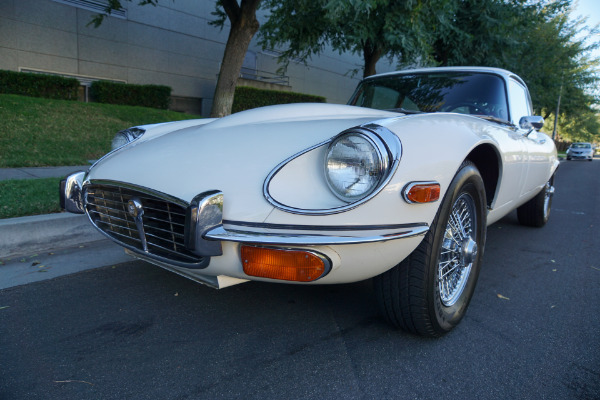 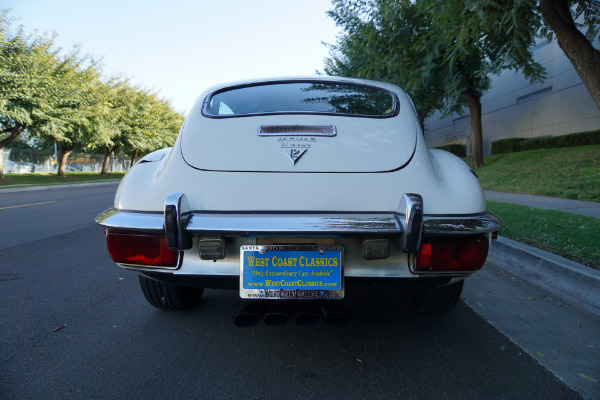 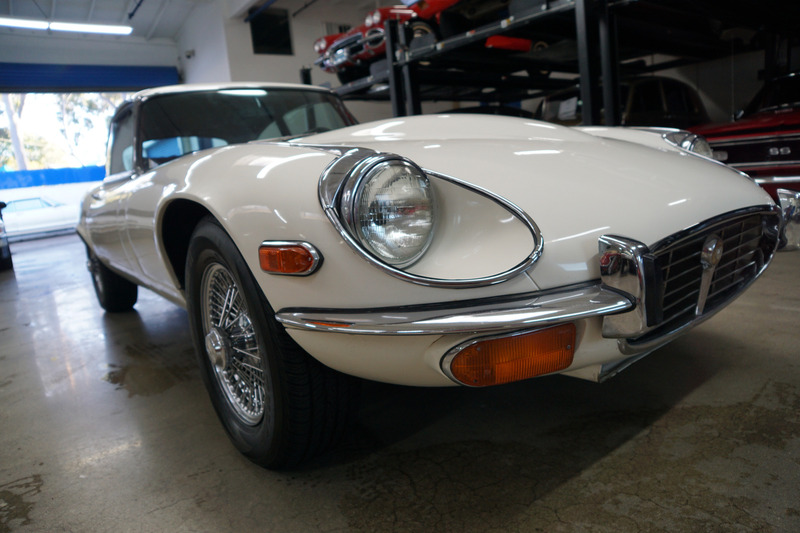 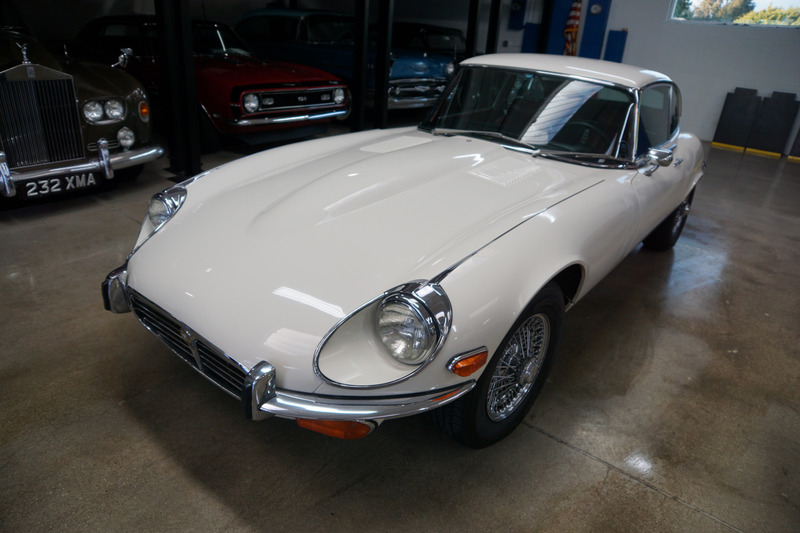 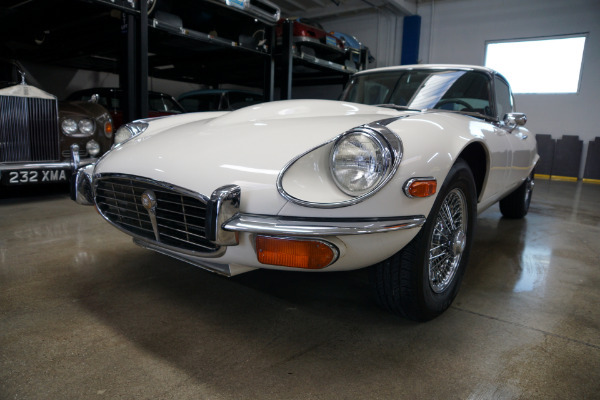 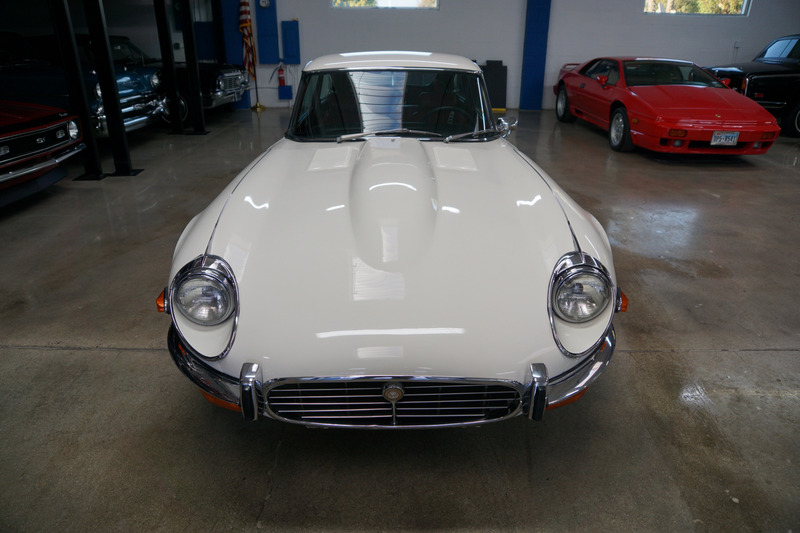 A rust free example of this coveted Series III 1972 Jaguar XKE 2+2 V12 coupe with the very desirable 4 speed manual transmission and its original matching #'s (7S5936LA) 5.4L V12 engine in a most striking original 'Old English White' color with a 'Berry Red' leather interior and carpets and factory air conditioning and power steering! 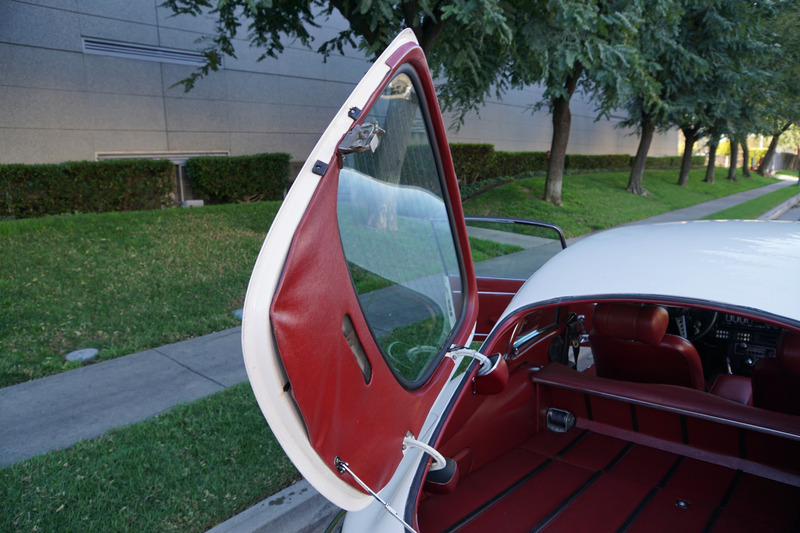 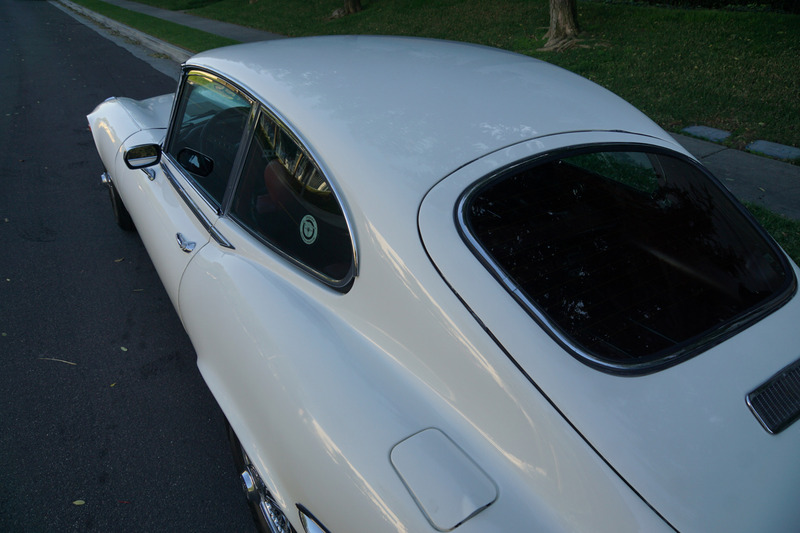 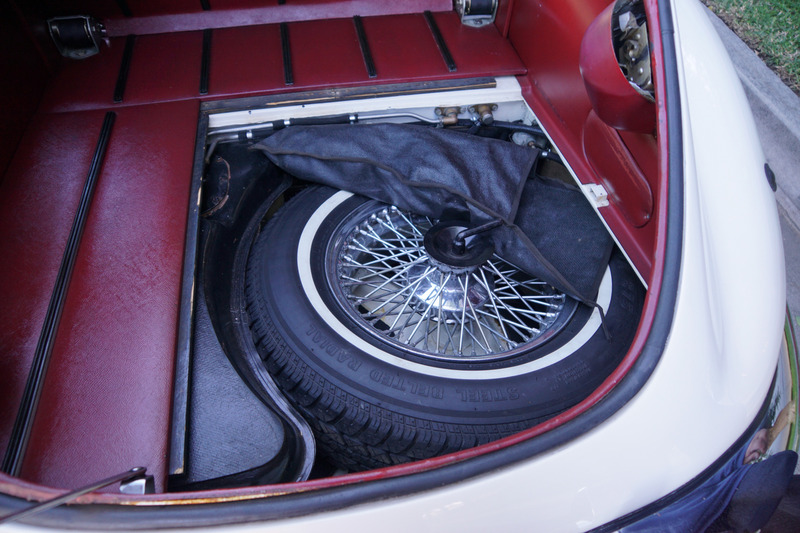 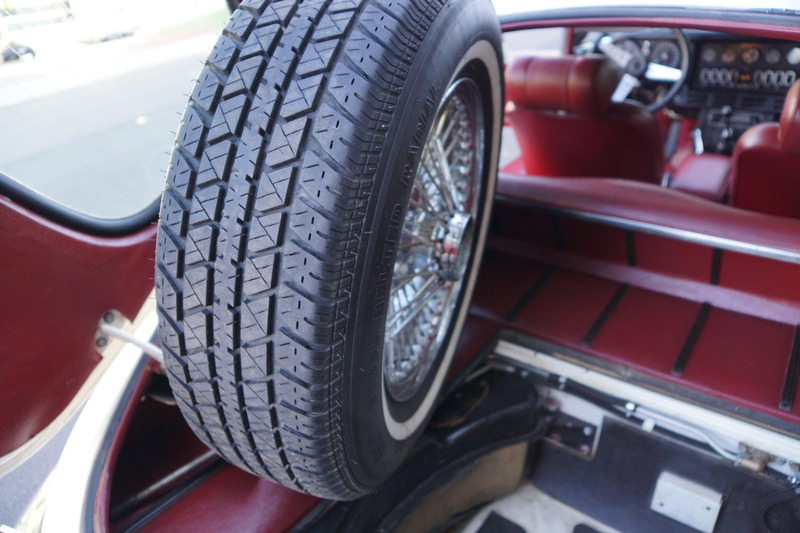 This beauty also boasts five original chrome wire wheels, including its original spare in the trunk! 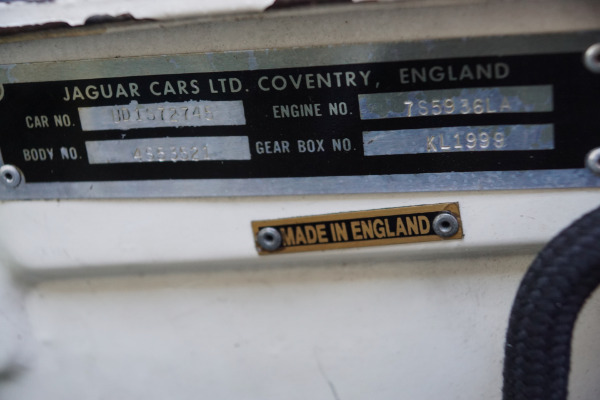 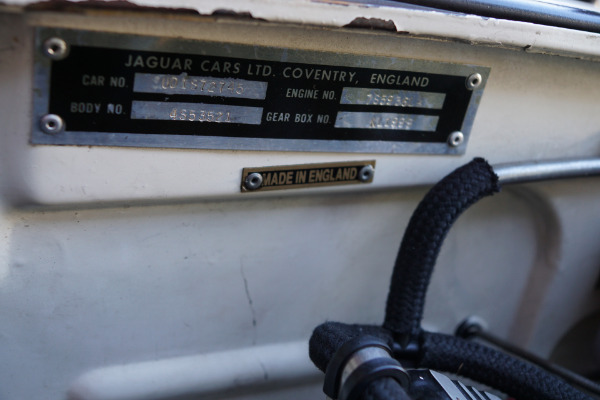 The Series III E-Type XKE Jaguar was built from late 1971-74 and was a continuation of its legendary 60's sports cars but now with a new V12 engine! 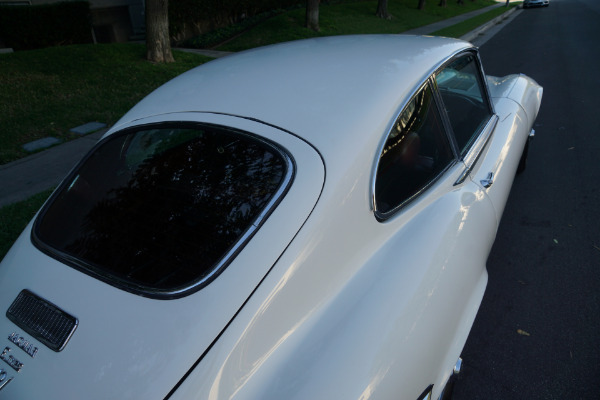 To accommodate the larger powerplant, Jaguar used the 9" longer wheelbase previously used for the Series I and II 2+2 coupes. 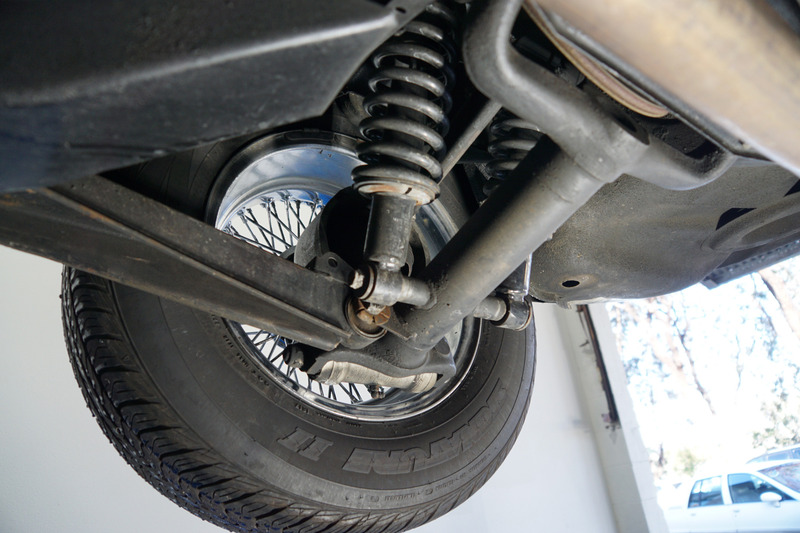 Body modifications also included a wider track with wider tires mounted on slotted wheels with disc wheel covers or optional wire wheels. These cars were fast with 0-60mph recorded in 7.5 seconds and a 15.4 second quarter mile! 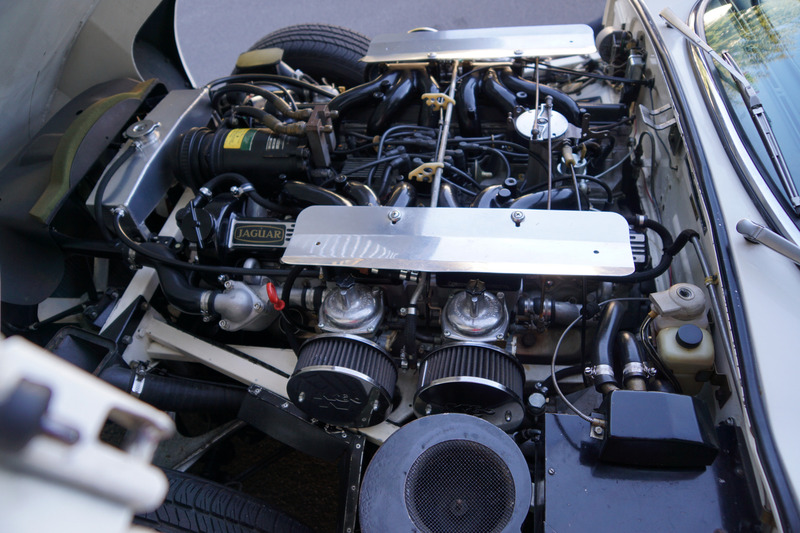 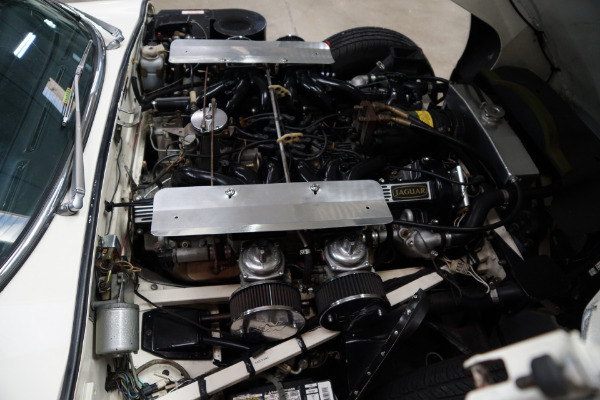 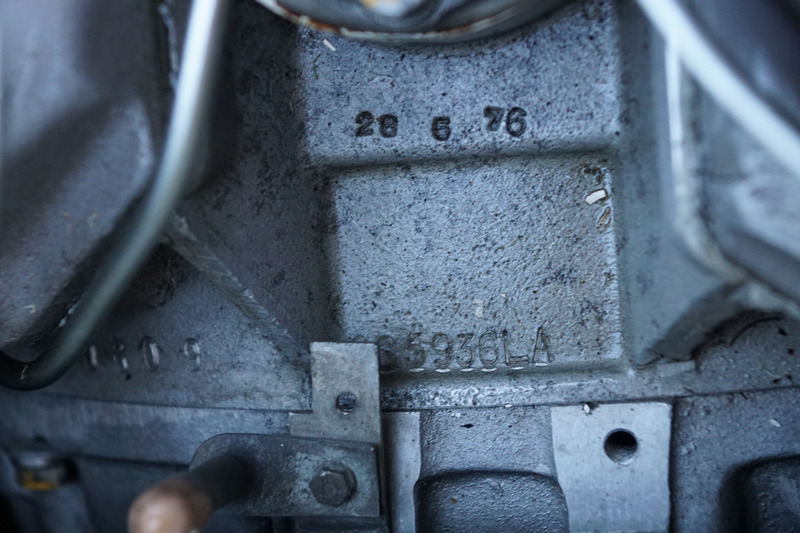 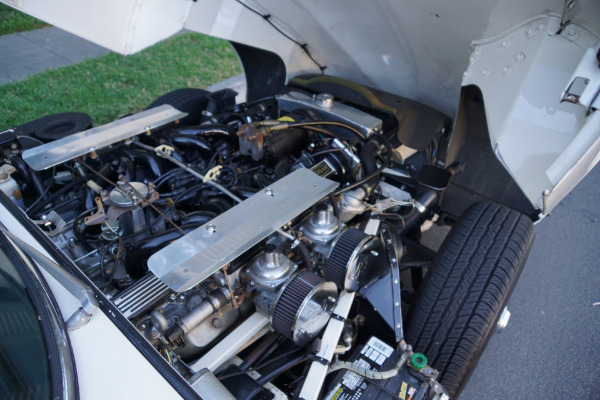 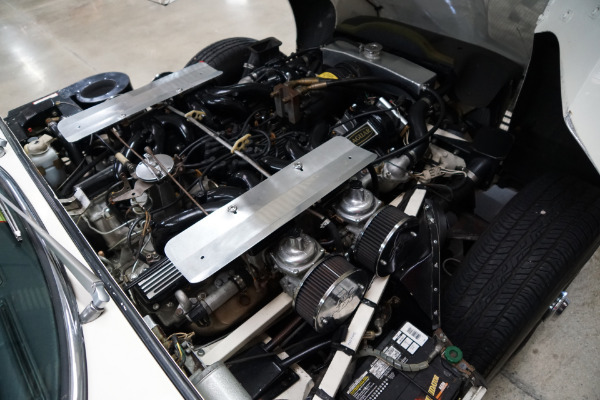 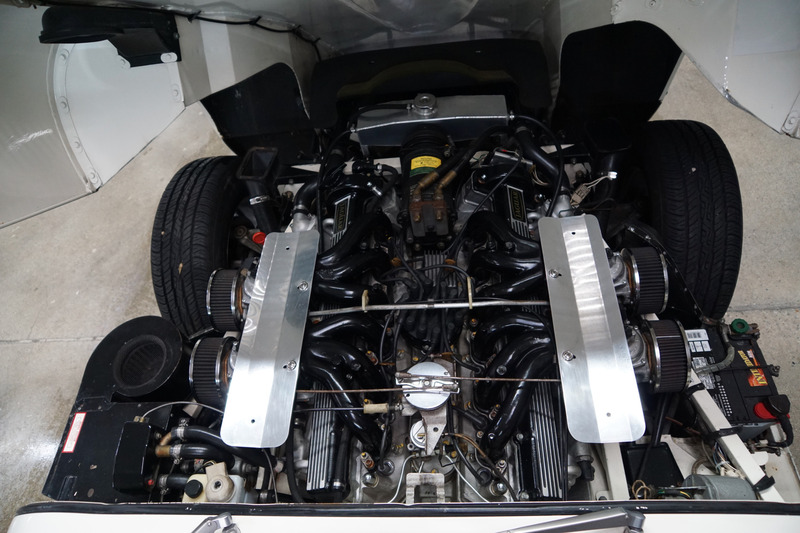 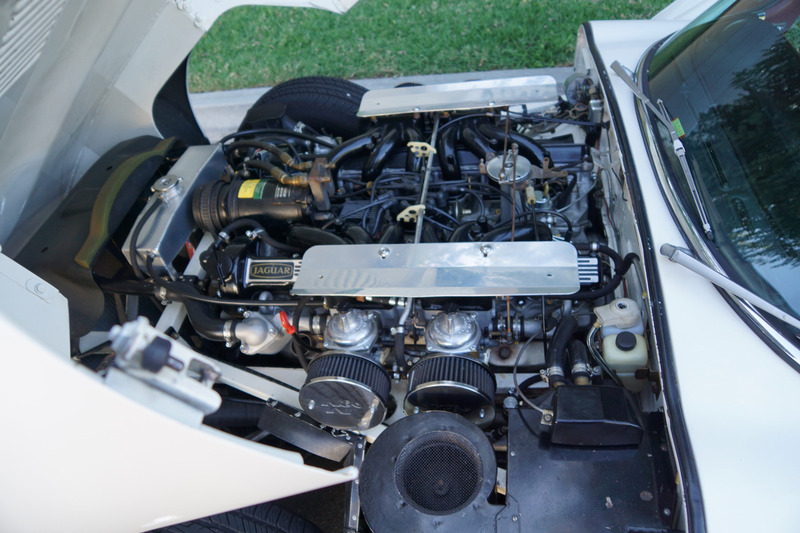 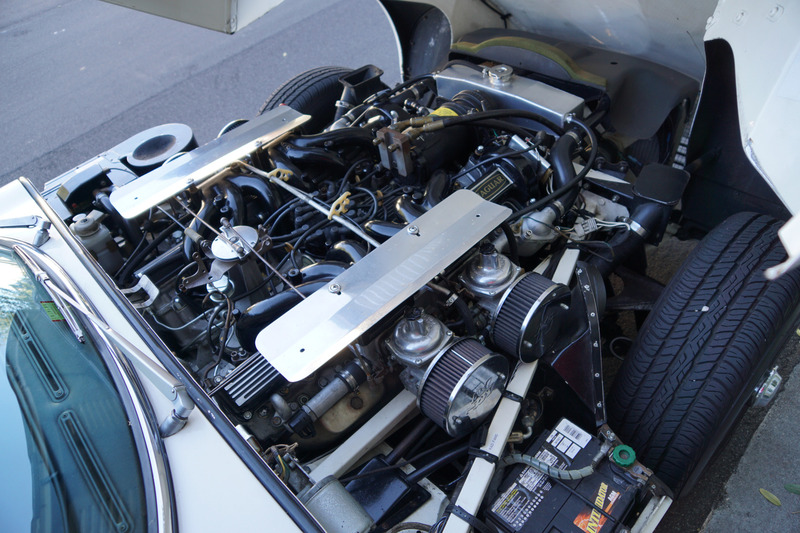 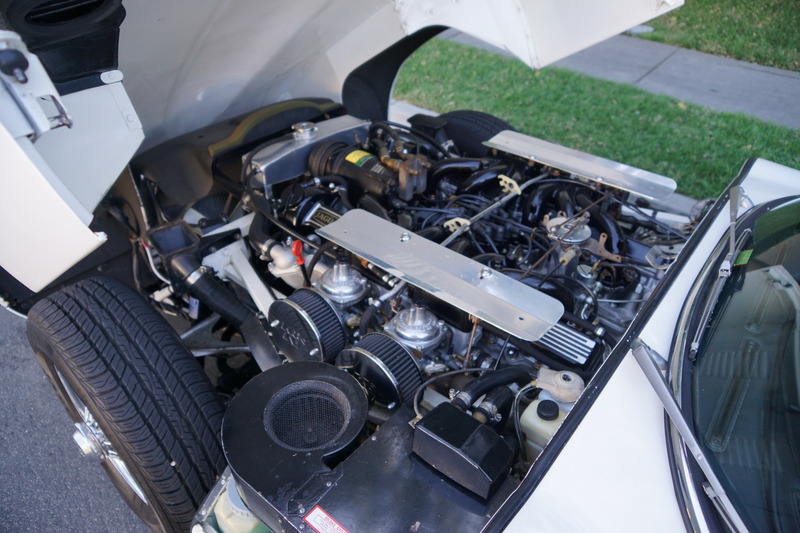 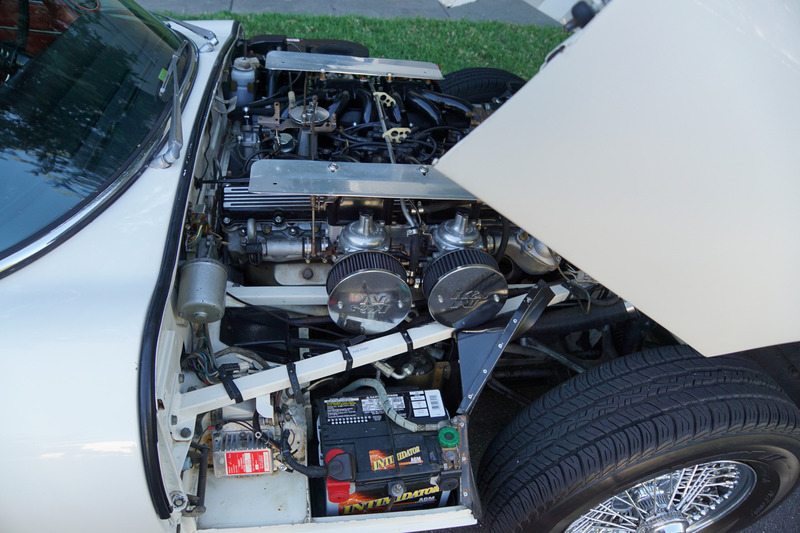 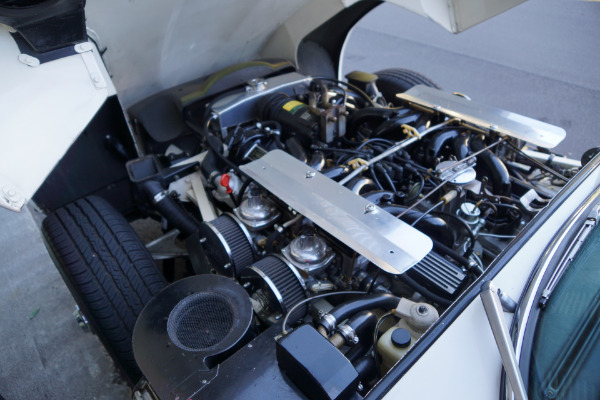 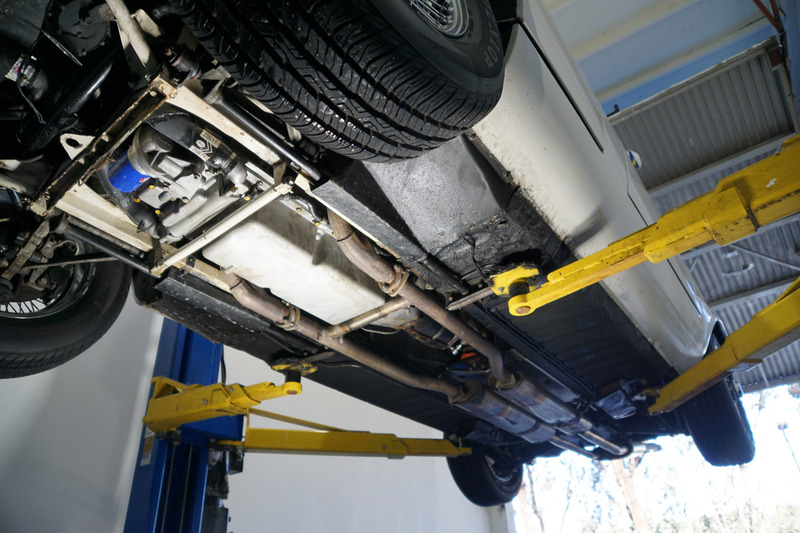 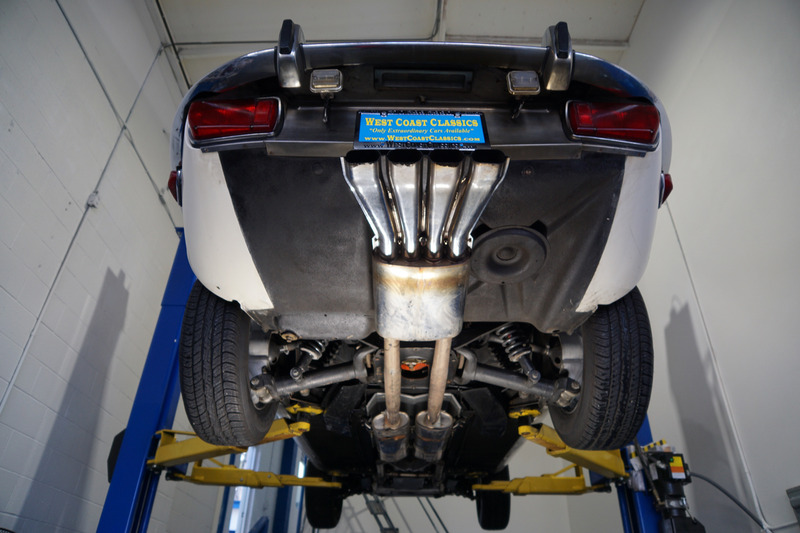 This particular car has a thick file of extensive service records showing that at no time was any expense spared on this vehicle's preventive maintenance and its original matching #'s 5.4L V12 engine runs as smooth as silk and the transmission shifts smoothly through all the gears. 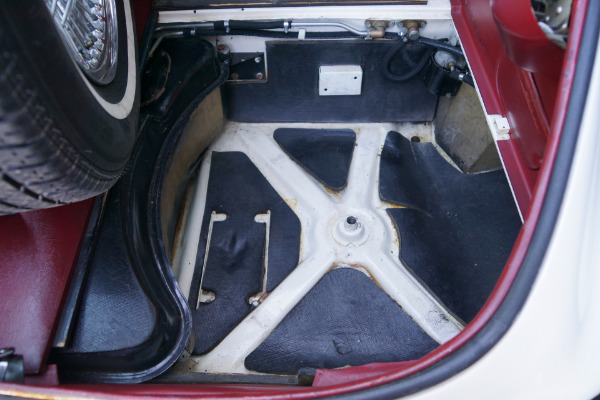 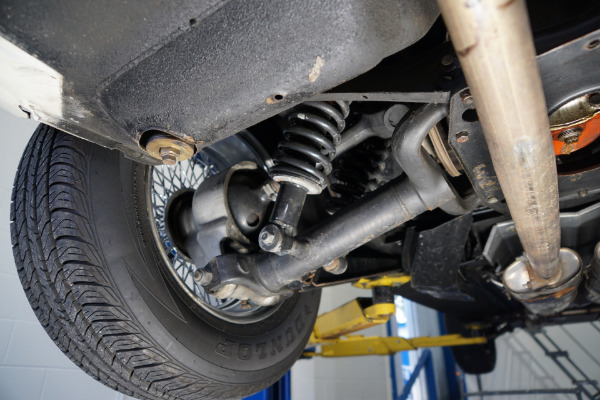 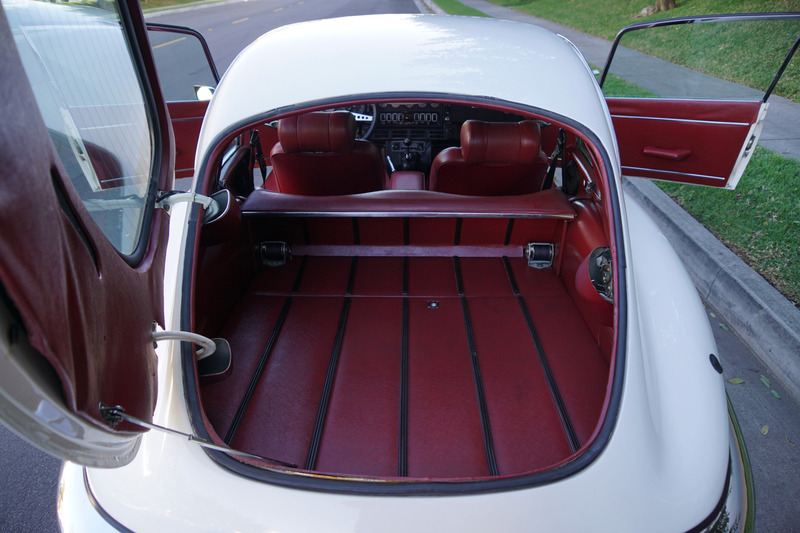 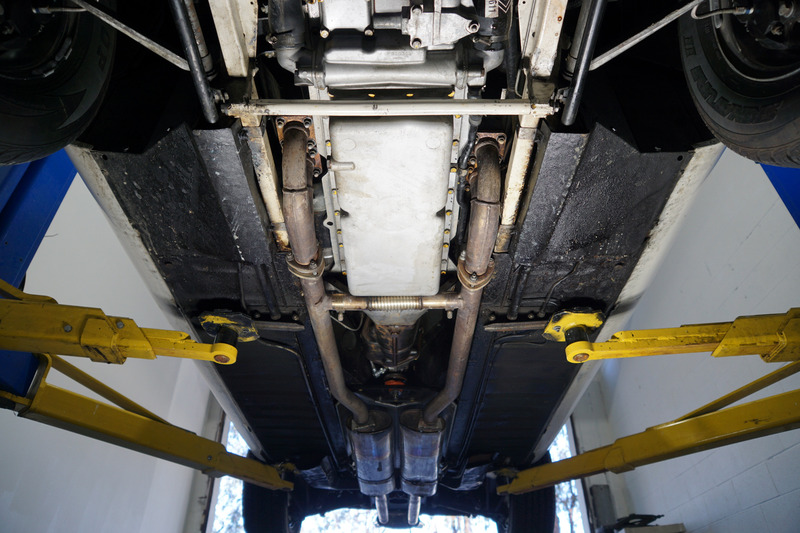 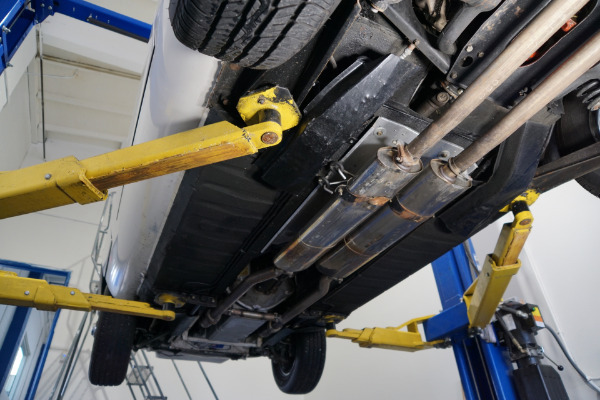 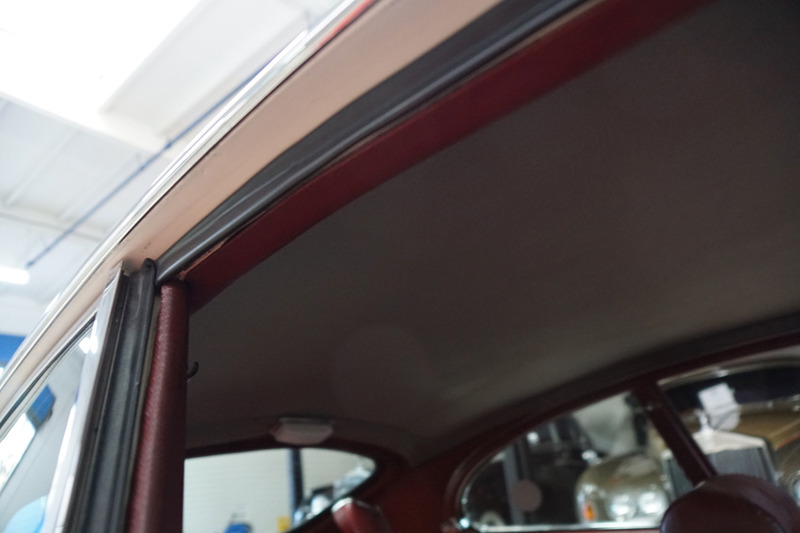 The car has no rust with the floor boards and all the typical rust-prone areas very solid! 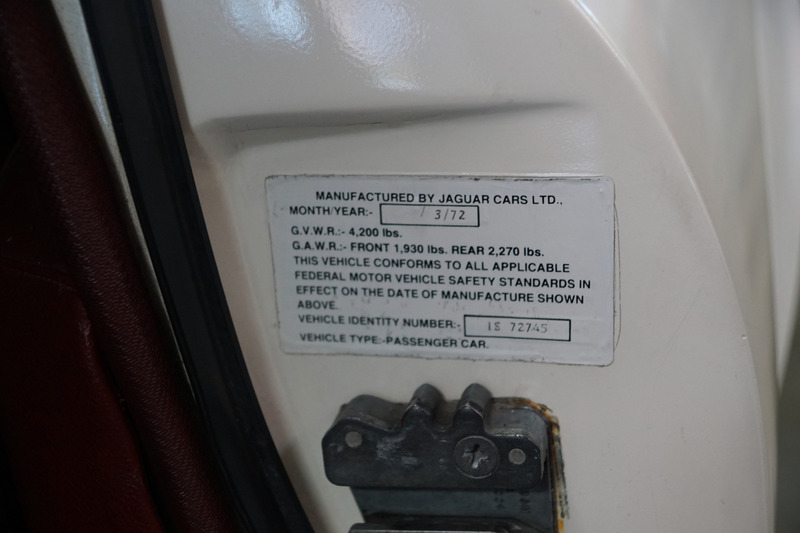 The car shows no signs of any accidents of any kind and has a very straight body. 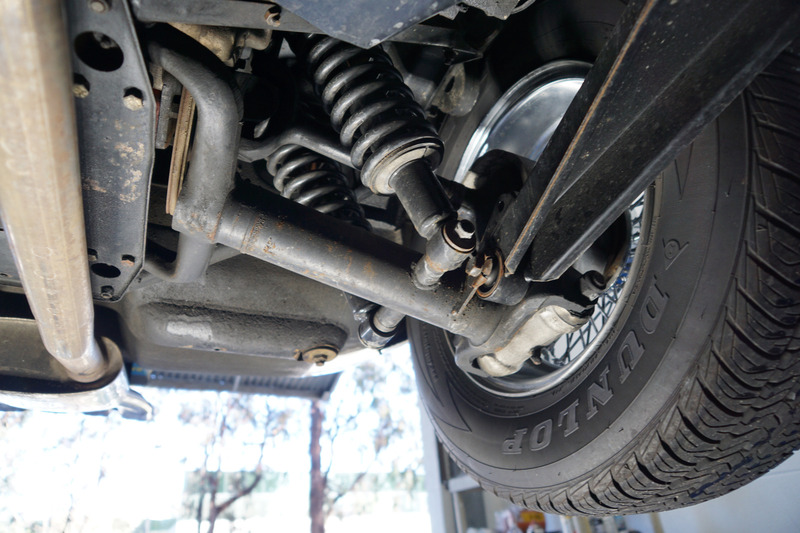 The thick file of recent service history shows a total front end engine rebuild has been completed, new front & rear engine main seals, new clutch new front & rear brake pads & rotors & calipers, new brake master cylinder & brake servo, upgraded torsion bars and front sway bars, new aluminum radiator, new expansion tank, new electronic distributor & ignition kit, plugs & wires, new front shocks & rear springs, resealed transmission drain plug, oil pan & rear differential, rebuilt carburetors, rebuild power steering pump, rebuild steering rack, new valve cover gasket, new wiring, new battery, new tires, new fully retractable non-electric antenna, and reconditioned heater fan & air conditioning converted from R-12 to R-134. 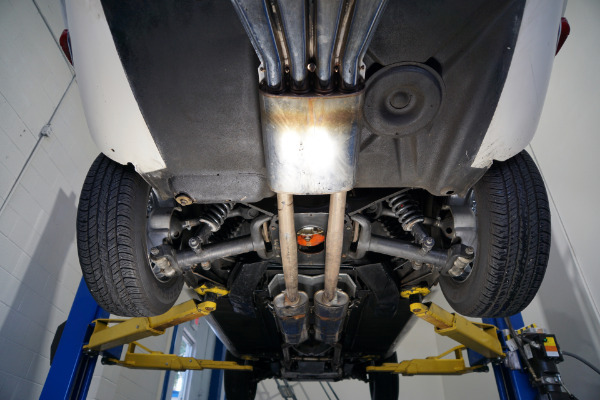 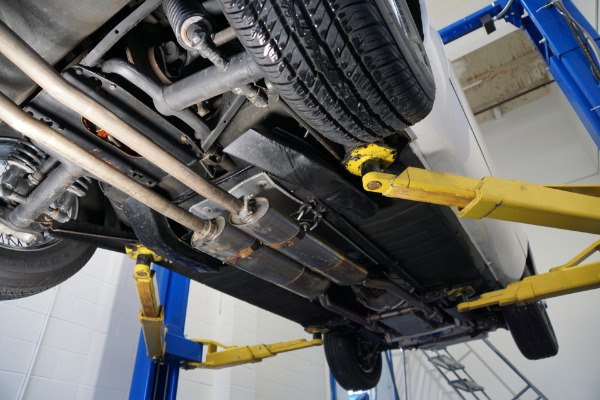 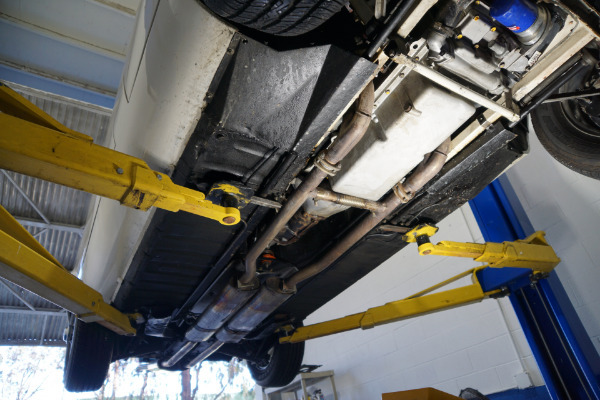 The car also has tasteful performance upgrades including the removal of the emission control equipment, including the smog pump and air rails with custom manufactured plates installed, K&N air filters and a new stainless steel exhaust. 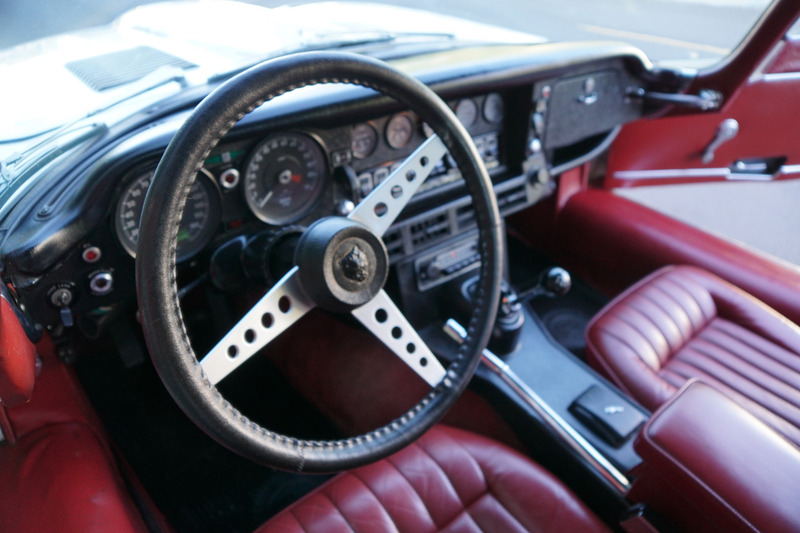 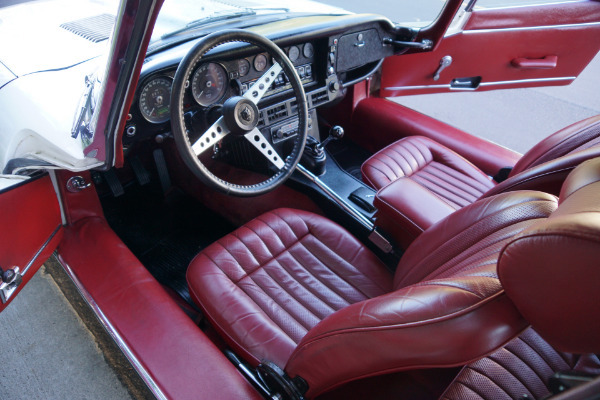 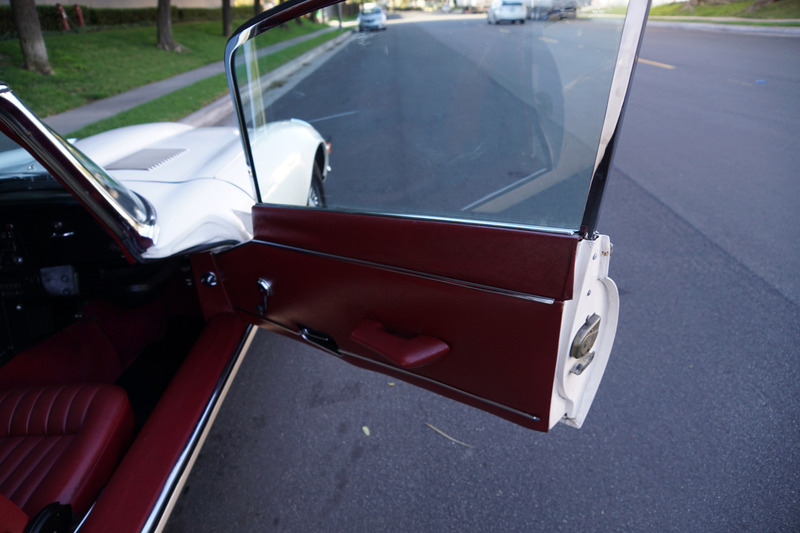 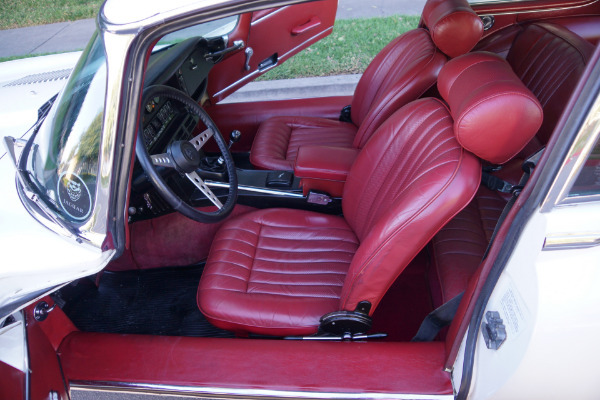 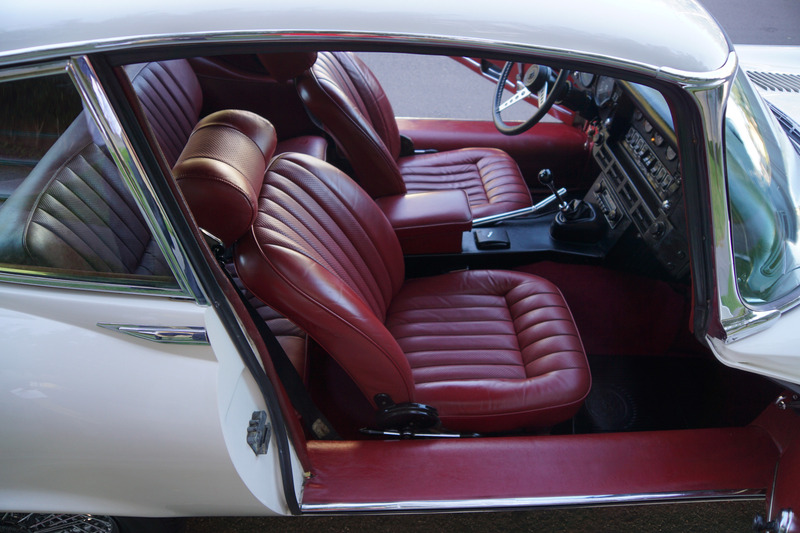 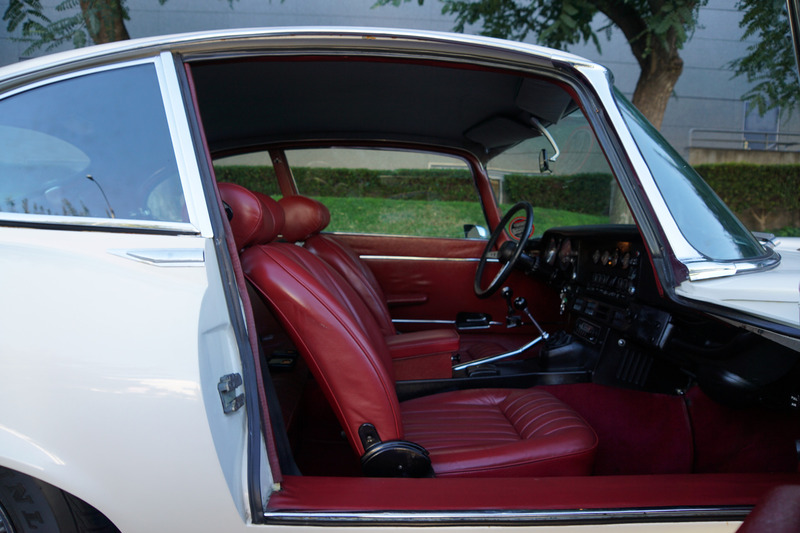 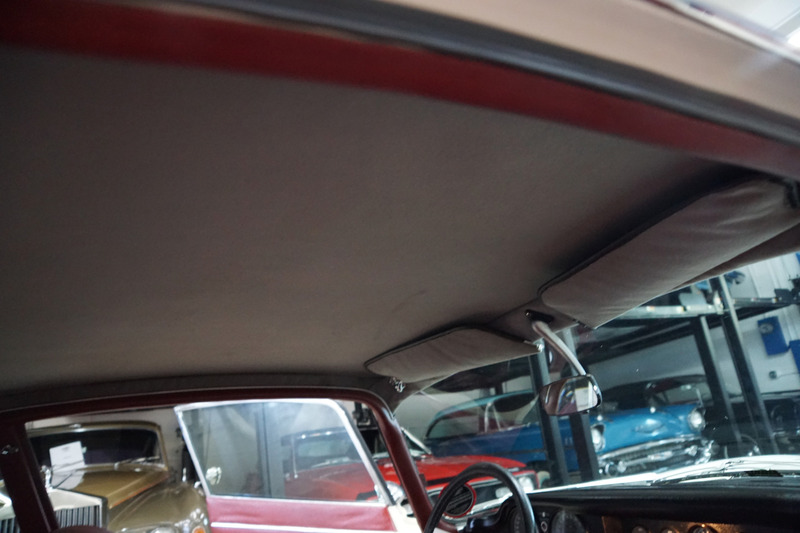 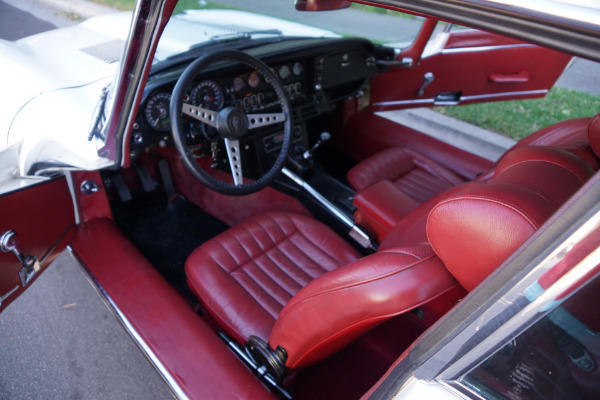 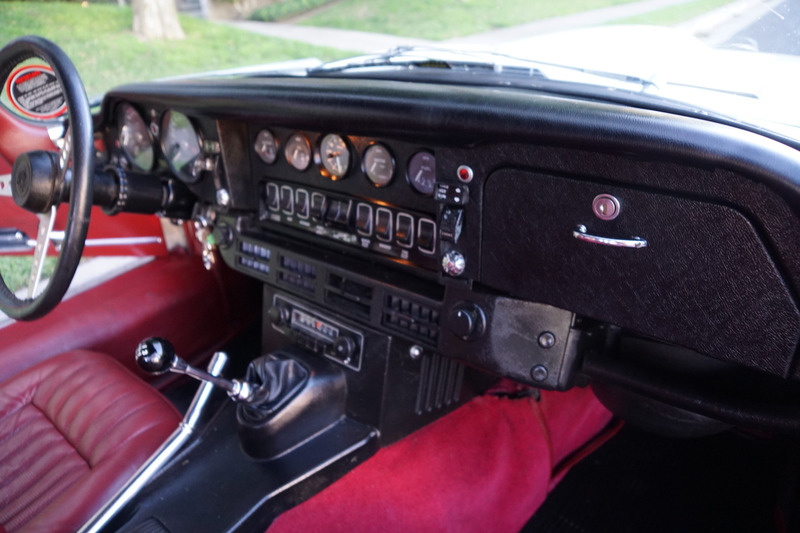 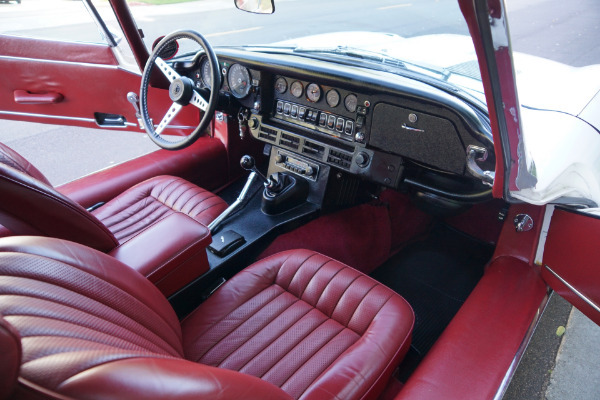 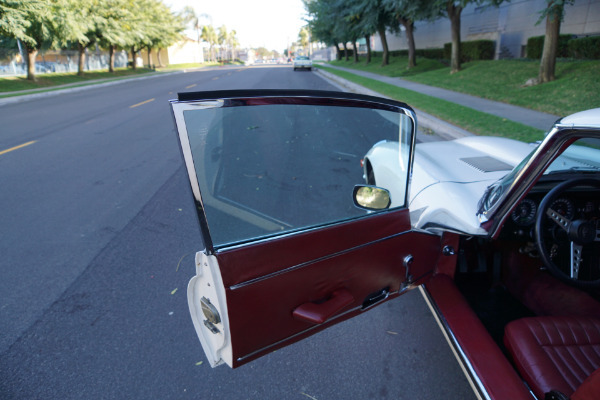 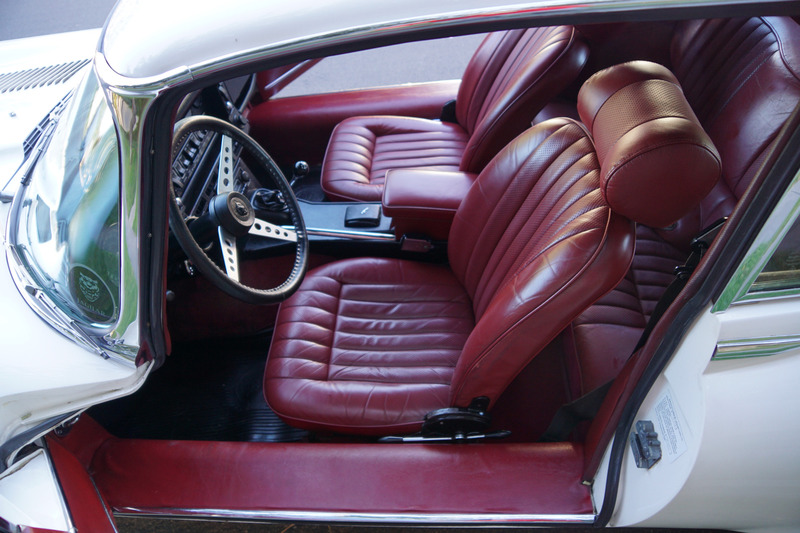 The car is a lovely older restoration with all new chrome and it looks extremely impressive with its 'Old English White' color paint with a lovely 'Berry Red' leather interior with the door panels, dashboard, seats and carpets all in very fine condition throughout. 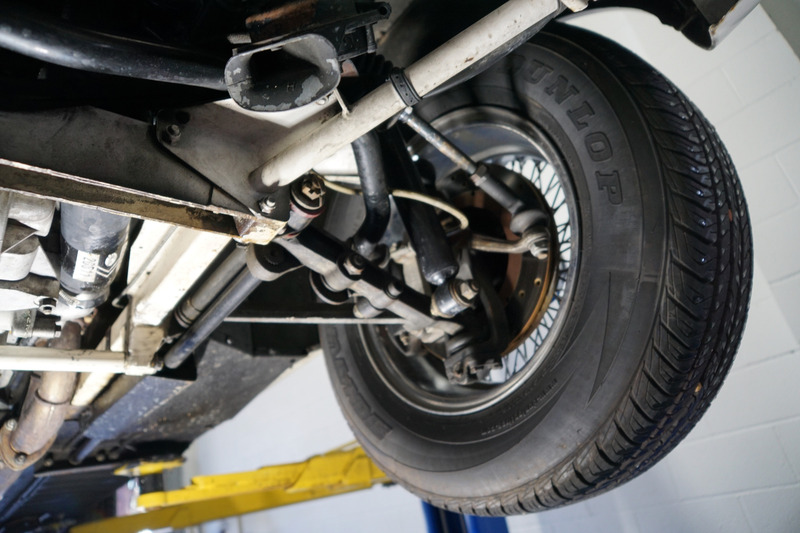 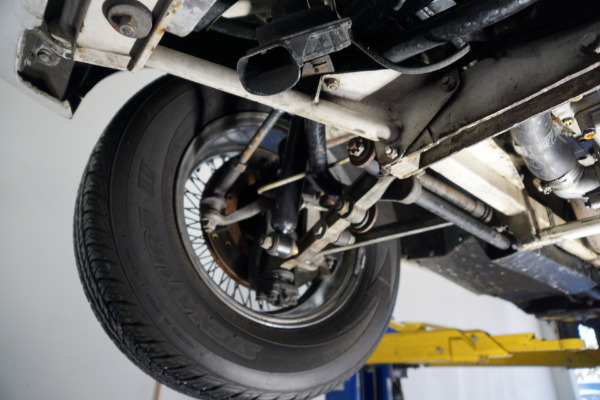 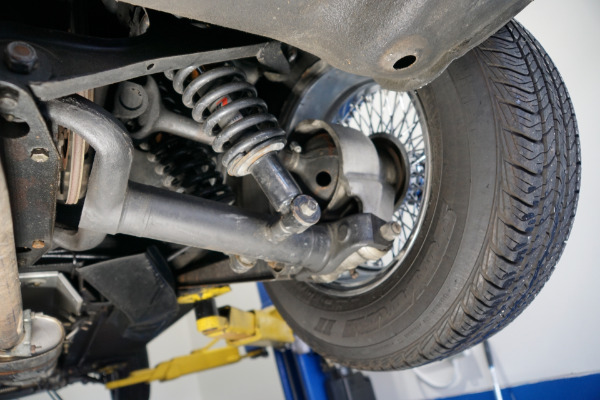 The car also boasts four optional factory chrome wire wheels which are also in great shape and the car has its original spare wire wheel located in the trunk. 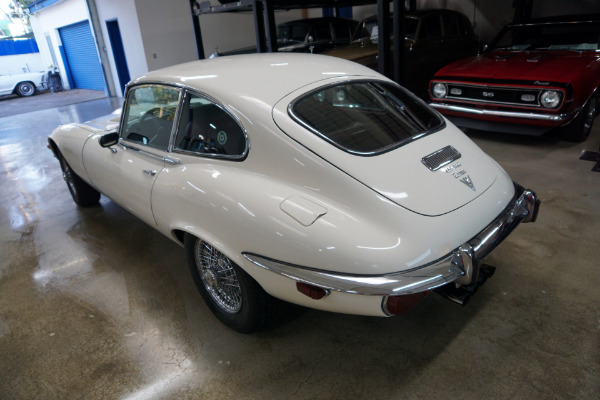 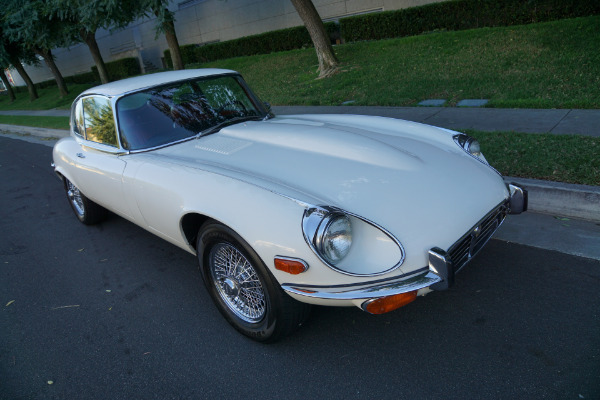 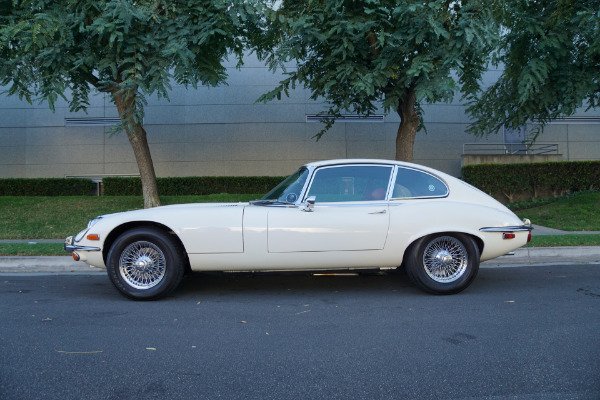 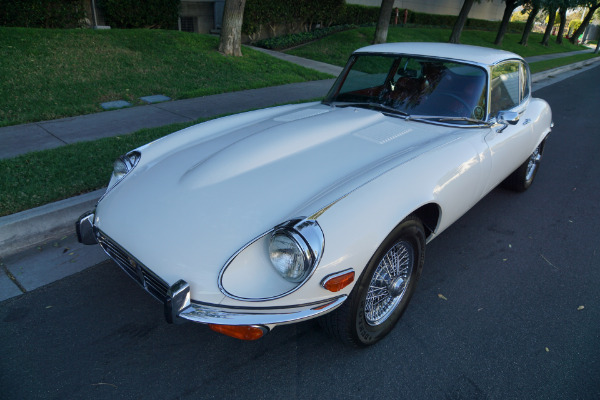 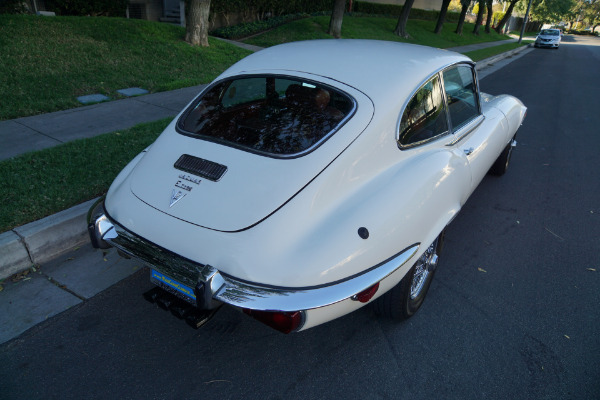 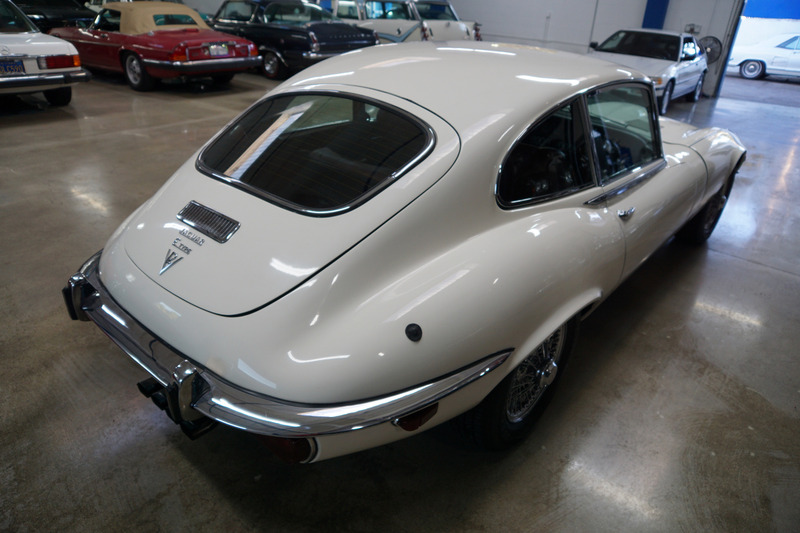 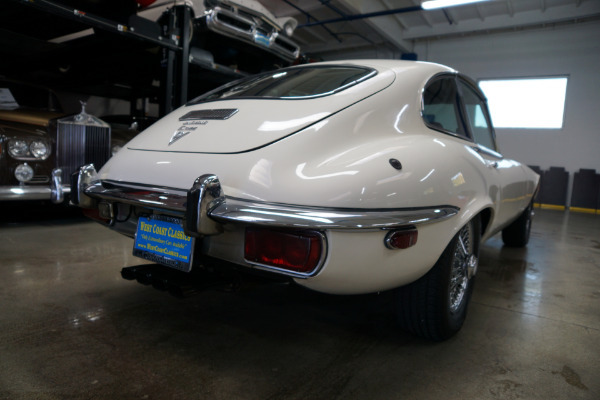 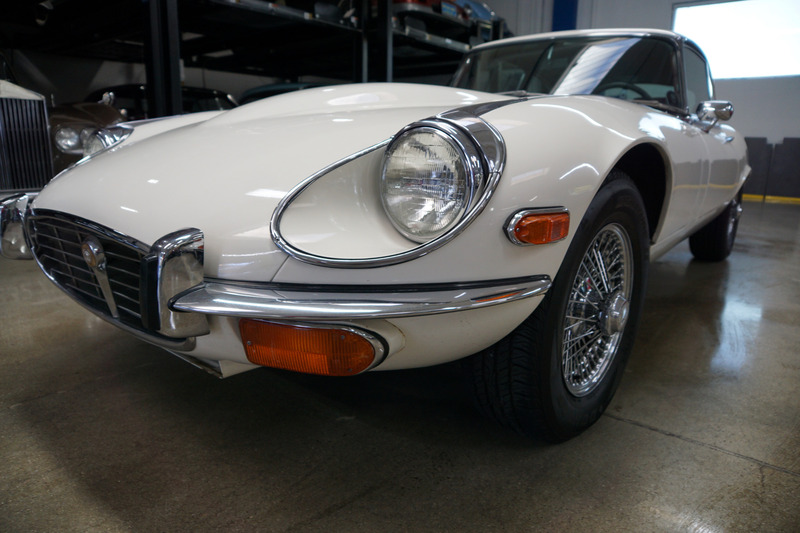 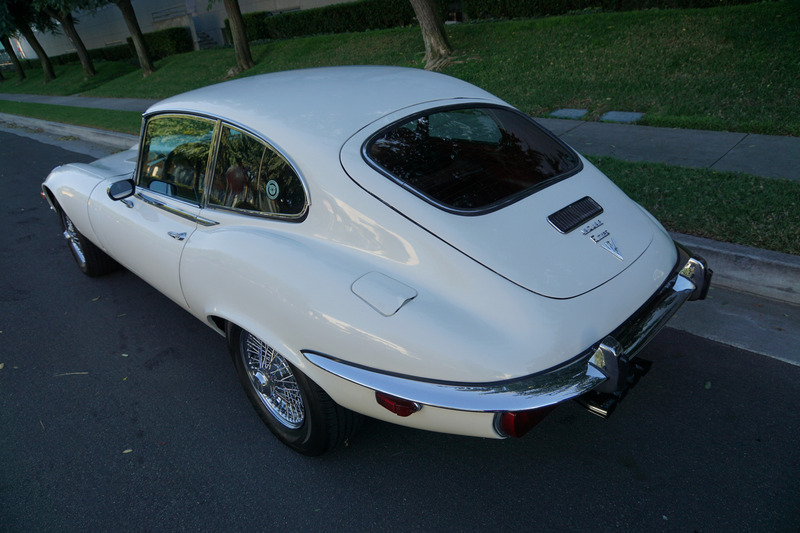 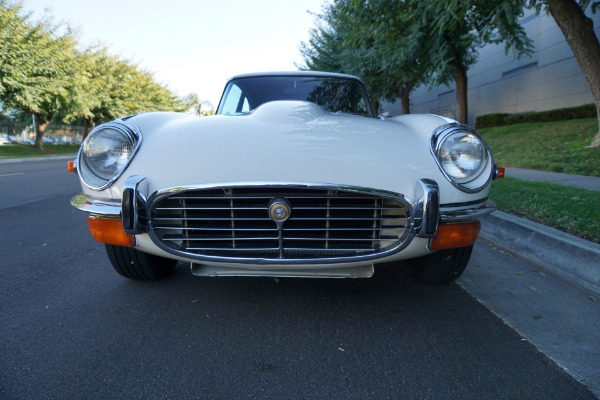 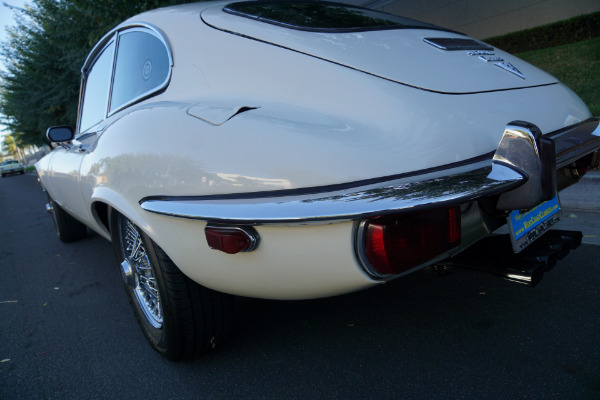 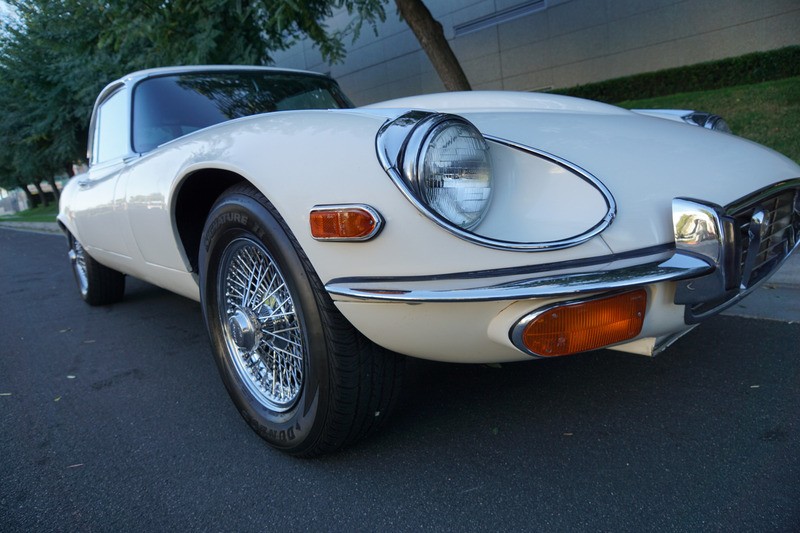 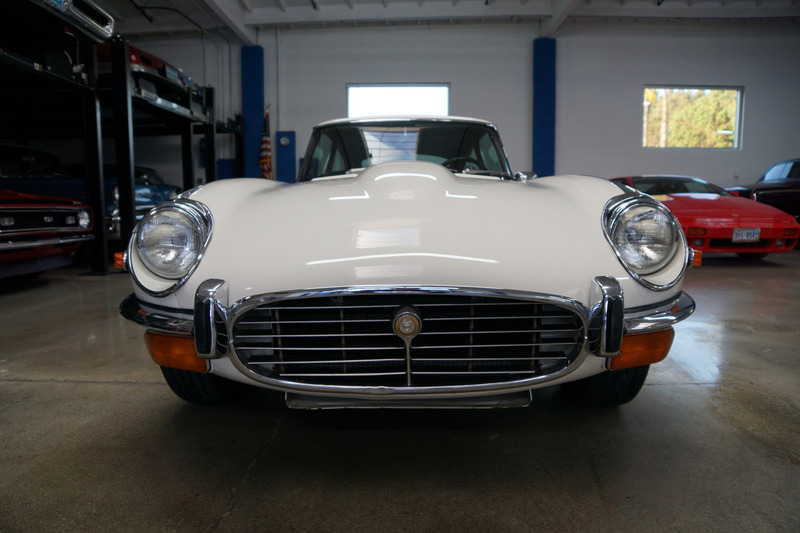 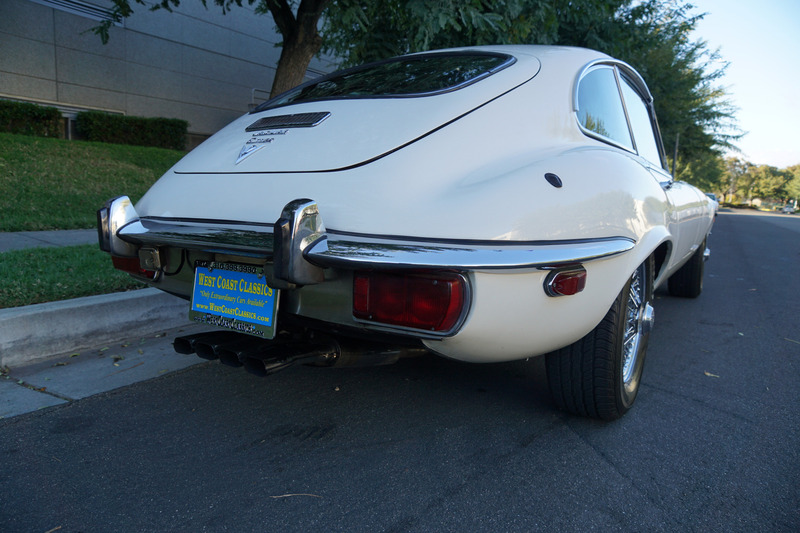 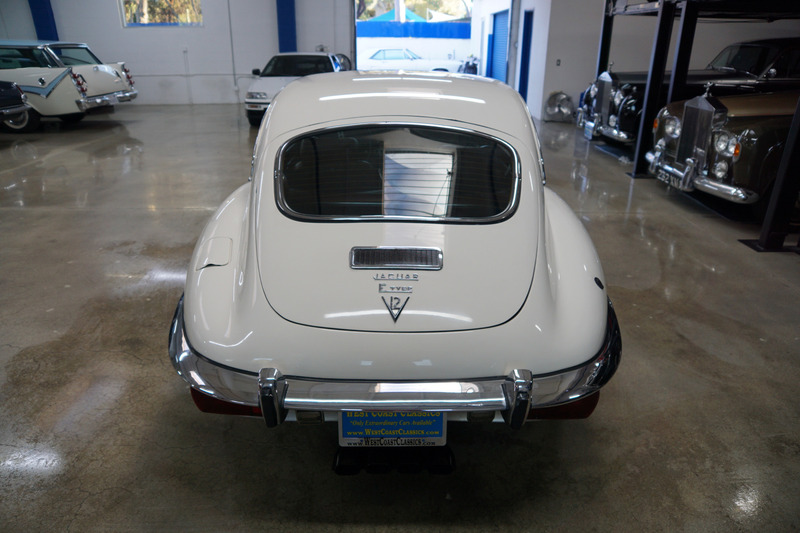 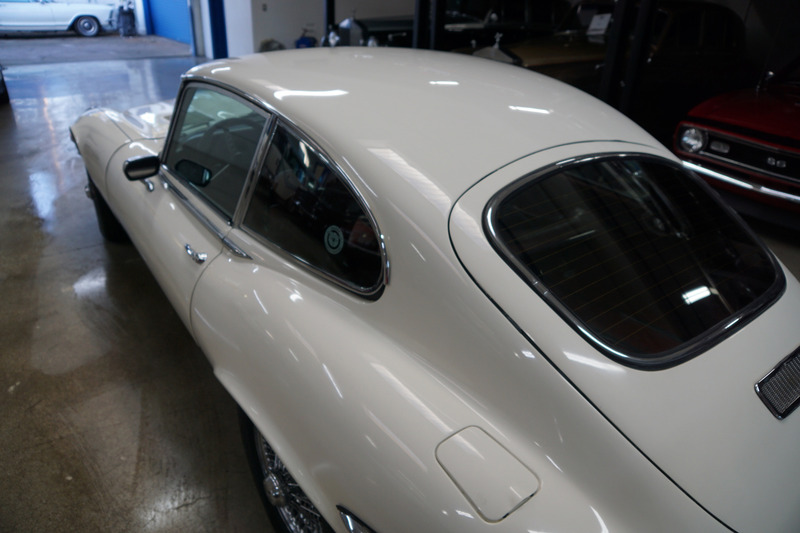 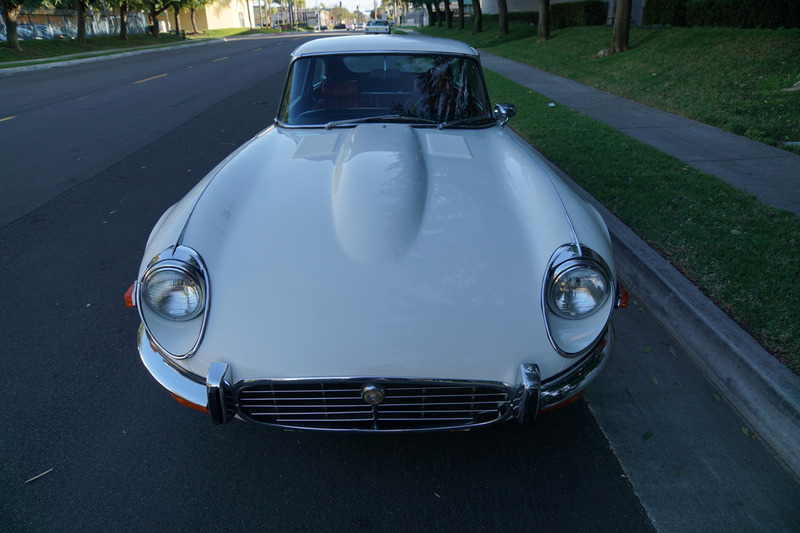 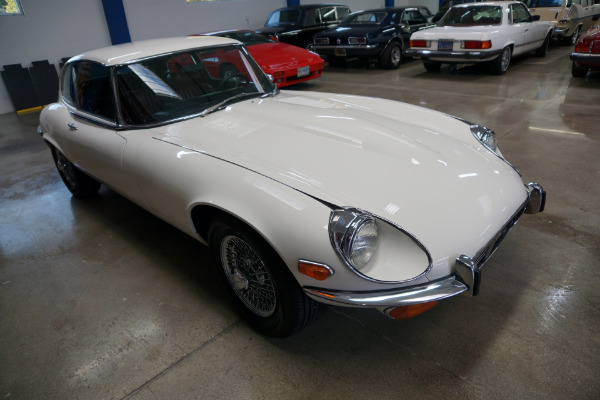 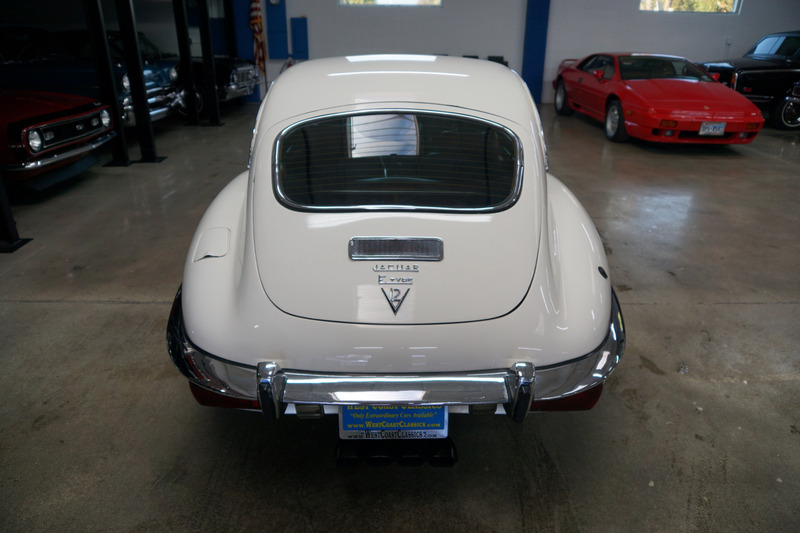 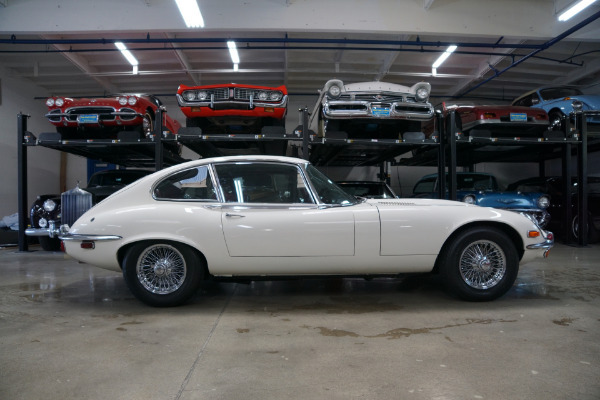 This is a rare opportunity to own a very striking and great daily driving example of an obviously always well maintained and garaged and turn key ready 1972 Jaguar XKE V12 E-Type 2+2 Series III Coupe with a very desirable 4 speed manual transmission in very fine condition throughout!